1 C None No Power Seat 1 C is a standard Business Plus Class seat however, the proximity to the lavatory and galleys may be bothersome. 1 E None No Power Seat 1 E is a standard Business Plus Class seat however, the proximity to the lavatory and galleys may be bothersome. 1 G None No Power Seat 1 G is a standard Business Plus Class seat however, the proximity to the lavatory and galleys may be bothersome. 1 J None No Power Seat 1 J is a standard Business Plus Class seat however, the proximity to the lavatory and galleys may be bothersome. 11 A None No Power Seat 11 A is a standard Premium Economy Class seat located at a bulkhead. There may be no floor storage during take-off and landing. 11 C None No Power Seat 11 C is a standard Premium Economy Class seat that has extra legroom. The tray table is in the armrest, making the armrest immovable and slightly reducing seat width. There may be no floor storage during take-off and landing. 11 D None No Power Seat 11 D is a standard Premium Economy Class seat that has extra legroom. The tray table is in the armrest, making the armrest immovable and slightly reducing seat width. There may be no floor storage during take-off and landing. 11 E None No Power Seat 11 E is a standard Premium Economy Class seat that has extra legroom. The tray table is in the armrest, making the armrest immovable and slightly reducing seat width. There may be no floor storage during take-off and landing. 11 H None No Power Seat 11 H is a standard Premium Economy Class seat that has extra legroom. The tray table is in the armrest, making the armrest immovable and slightly reducing seat width. There may be no floor storage during take-off and landing. 11 J None No Power Seat 11 J is a standard Premium Economy Class seat that has extra legroom. The tray table is in the armrest, making the armrest immovable and slightly reducing seat width. There may be no floor storage during take-off and landing. 11 L None No Power Seat 11 L is a standard Premium Economy Class seat that has extra legroom. The tray table is in the armrest, making the armrest immovable and slightly reducing seat width. There may be no floor storage during take-off and landing. 12 A None No Power Seat 12 A is a standard Premium Economy Class seat. 12 C None No Power Seat 12 C is a standard Premium Economy Class seat. 12 D None No Power Seat 12 D is a standard Premium Economy Class seat. 12 E None No Power Seat 12 E is a standard Premium Economy Class seat. 12 H None No Power Seat 12 H is a standard Premium Economy Class seat. 12 J None No Power Seat 12 J is a standard Premium Economy Class seat. 12 L None No Power Seat 12 L is a standard Premium Economy Class seat. 14 C None No Power Seat 14 C is a standard Premium Economy Class seat, however, the proximity to the galley and lavatory may be bothersome. 14 D None No Power Seat 14 D is a standard Premium Economy Class seat, however, the proximity to the galley and lavatory may be bothersome. 14 E None No Power Seat 14 E is a standard Premium Economy Class seat, however, the proximity to the galley and lavatory may be bothersome. 14 H None No Power Seat 14 H is a standard Premium Economy Class seat, however, the proximity to the galley and lavatory may be bothersome. 14 J None No Power Seat 14 J is a standard Premium Economy Class seat, however, the proximity to the galley and lavatory may be bothersome. 14 L None No Power Seat 14 L is a standard Premium Economy Class seat. 15 A None No Power Seat 15 A is a standard Premium Economy Class seat. 15 C None No Power Seat 15 C is a standard Premium Economy Class seat, however, the proximity to the galley and lavatory may be bothersome. 2 A None No Power Seat 2 A is a standard Business Plus Class seat. 2 D None No Power Seat 2 D is a standard Business Plus Class seat. 2 H None No Power Seat 2 H is a standard Business Plus Class seat. 2 L None No Power Seat 2 L is a standard Business Plus Class seat. 21 A None No Power Seat 21 A is a standard Economy Class seat that has extra legroom due to the exit, however, the Exit Door protrusion may be bothersome. The proximity to the galley may be bothersome. The tray table and inflight entertainment monitor are in the armrest, making the armrest immovable and slightly reducing seat width. There may be no floor storage during take-off and landing. 21 C None No Power Seat 21 C is a standard Economy Class seat that has extra legroom due to the exit, however, the proximity to the galley may be bothersome. The tray table and inflight entertainment monitor are in the armrest, making the armrest immovable and slightly reducing seat width. There may be no floor storage during take-off and landing. 21 J None No Power Seat 21 J is a standard Economy Class seat that has extra legroom due to the exit however, the proximity to the galley may be bothersome. The tray table and inflight entertainment monitor are in the armrest, making the armrest immovable and slightly reducing seat width. There may be no floor storage during take-off and landing. 21 L None No Power Seat 21 L is a standard Economy Class seat that has extra legroom due to the exit however, the Exit Door protrusion may be bothersome. The proximity to the galley may be bothersome. The tray table and inflight entertainment monitor are in the armrest, making the armrest immovable and slightly reducing seat width. There may be no floor storage during take-off and landing. 22 D None No Power Seat 22 D is a standard Economy Class seat that has extra legroom due to the bulkhead, however, the proximity to the lavatories and galleys may be bothersome. The tray table is in the armrest, making the armrest immovable and slightly reducing seat width. There may be no floor storage during take-off and landing. 22 E None No Power Seat 22 E is a standard Economy Class seat that has extra legroom due to the bulkhead, however, the proximity to the lavatories and galleys may be bothersome. The tray table is in the armrest, making the armrest immovable and slightly reducing seat width. There may be no floor storage during take-off and landing. 22 G None No Power Seat 22 G is a standard Economy Class seat that has extra legroom due to the bulkhead, however, the proximity to the lavatories and galleys may be bothersome. The tray table is in the armrest, making the armrest immovable and slightly reducing seat width. There may be no floor storage during take-off and landing. 22 H None No Power Seat 22 H is a standard Economy Class seat that has extra legroom due to the bulkhead, however, the proximity to the lavatories and galleys may be bothersome. The tray table is in the armrest, making the armrest immovable and slightly reducing seat width. There may be no floor storage during take-off and landing. 3 C None No Power Seat 3 C is a standard Business Plus Class seat. 3 E None No Power Seat 3 E is a standard Business Plus Class seat. 3 G None No Power Seat 3 G is a standard Business Plus Class seat. 3 J None No Power Seat 3 J is a standard Business Plus Class seat. 31 A None No Power Seat 31 A is a standard Economy Class seat that has limited recline due to the Exit Row behind. 31 C None No Power Seat 31 C is a standard Economy Class seat that has limited recline due to the Exit Row behind. 31 J None No Power Seat 31 J is a standard Economy Class seat that has limited recline due to the Exit Row behind. 31 L None No Power Seat 31 L is a standard Economy Class seat that has limited recline due to the Exit Row behind. 32 D None No Power Seat 32 D is a standard Economy Class seat that has limited recline due to the Exit Row behind. 32 E None No Power Seat 32 E is a standard Economy Class seat that has limited recline due to the Exit Row behind. 32 G None No Power Seat 32 G is a standard Economy Class seat that has limited recline due to the Exit Row behind. 32 H None No Power Seat 32 H is a standard Economy Class seat that has limited recline due to the Exit Row behind. 33 A None No Power Seat 33 A is a standard Economy Class seat that has extra legroom due to the exit, however, the Exit Door protrusion may be bothersome. The tray table and inflight entertainment monitor are in the armrest, making the armrest immovable and slightly reducing seat width. There may be no floor storage during take-off and landing. 33 C None No Power Seat 33 C is a standard Economy Class seat that has extra legroom due to the exit, however, the crew seat opposite may be bothersome. The tray table and inflight entertainment monitor are in the armrest, making the armrest immovable and slightly reducing seat width. There may be no floor storage during take-off and landing. 33 D None No Power Seat 33 D is a standard Economy Class seat that has extra legroom due to the exit row. The tray table and inflight entertainment monitor are in the armrest, making the armrest immovable and slightly reducing seat width. There may be no floor storage during take-off and landing. 33 E None No Power Seat 33 E is a standard Economy Class seat that has extra legroom due to the exit row. The tray table and inflight entertainment monitor are in the armrest, making the armrest immovable and slightly reducing seat width. There may be no floor storage during take-off and landing. 33 G None No Power Seat 33 G is a standard Economy Class seat that has extra legroom due to the exit row. The tray table and inflight entertainment monitor are in the armrest, making the armrest immovable and slightly reducing seat width. There may be no floor storage during take-off and landing. 33 H None No Power Seat 33 H is a standard Economy Class seat that has extra legroom due to the exit row. The tray table and inflight entertainment monitor are in the armrest, making the armrest immovable and slightly reducing seat width. There may be no floor storage during take-off and landing. 33 J None No Power Seat 33 J is a standard Economy Class seat that has extra legroom due to the exit, however, the crew seat opposite may be bothersome. The tray table and inflight entertainment monitor are in the armrest, making the armrest immovable and slightly reducing seat width. There may be no floor storage during take-off and landing. 33 L None No Power Seat 33 L is a standard Economy Class seat that has extra legroom due to the exit, however, the Exit Door protrusion may be bothersome. The tray table and inflight entertainment monitor are in the armrest, making the armrest immovable and slightly reducing seat width. There may be no floor storage during take-off and landing. 4 A None No Power Seat 4 A is a standard Business Plus Class seat. 4 D None No Power Seat 4 D is a standard Business Plus Class seat. 4 H None No Power Seat 4 H is a standard Business Plus Class seat. 4 L None No Power Seat 4 L is a standard Business Plus Class seat. 46 D None No Power Seat 46 D is a standard Economy Class seat that may have limited recline and the proximity to the lavatories may be bothersome. 46 E None No Power Seat 46 E is a standard Economy Class seat that may have limited recline and the proximity to the lavatories may be bothersome. 46 G None No Power Seat 46 G is a standard Economy Class seat that may have limited recline and the proximity to the lavatories may be bothersome. 46 H None No Power Seat 46 H is a standard Economy Class seat that may have limited recline and the proximity to the lavatories may be bothersome. 47 A None No Power Seat 47 A is a standard Economy Class seat that has extra legroom due to the exit, however, the Exit Door protrusion may be bothersome. The tray table and inflight entertainment monitor are in the armrest, making the armrest immovable and slightly reducing seat width. There may be no floor storage during take-off and landing. 47 C None No Power Seat 47 C is a standard Economy Class seat that has extra legroom due to the exit, however, the Exit Door protrusion may be bothersome. The tray table and inflight entertainment monitor are in the armrest, making the armrest immovable and slightly reducing seat width. There may be no floor storage during take-off and landing. 47 J None No Power Seat 47 J is a standard Economy Class seat that has extra legroom due to the exit, however, the Exit Door protrusion may be bothersome. The tray table and inflight entertainment monitor are in the armrest, making the armrest immovable and slightly reducing seat width. There may be no floor storage during take-off and landing. 47 L None No Power Seat 47 L is a standard Economy Class seat that has extra legroom due to the exit, however, the Exit Door protrusion may be bothersome. The tray table and inflight entertainment monitor are in the armrest, making the armrest immovable and slightly reducing seat width. There may be no floor storage during take-off and landing. 48 D None No Power Seat 48 D is a standard Economy Class seat located at a bulkhead. The proximity to the galley and lavatory may be bothersome. The tray table and inflight entertainment monitor are in the armrest, making the armrest immovable and slightly reducing seat width. There may be no floor storage during take-off and landing. 48 E None No Power Seat 48 E is a standard Economy Class seat located at a bulkhead. The proximity to the galley and lavatory may be bothersome. The tray table and inflight entertainment monitor are in the armrest, making the armrest immovable and slightly reducing seat width. There may be no floor storage during take-off and landing. 48 G None No Power Seat 48 G is a standard Economy Class seat located at a bulkhead. The proximity to the galley and lavatory may be bothersome. The tray table and inflight entertainment monitor are in the armrest, making the armrest immovable and slightly reducing seat width. There may be no floor storage during take-off and landing. 48 H None No Power Seat 48 H is a standard Economy Class seat located at a bulkhead. The proximity to the galley and lavatory may be bothersome. The tray table and inflight entertainment monitor are in the armrest, making the armrest immovable and slightly reducing seat width. There may be no floor storage during take-off and landing. 5 C None No Power Seat 5 C is a standard Business Plus Class seat. 5 E None No Power Seat 5 E is a standard Business Plus Class seat. 5 G None No Power Seat 5 G is a standard Business Plus Class seat. 5 J None No Power Seat 5 J is a standard Business Plus Class seat. 57 D None No Power Seat 57 D is a standard Economy Class seat that juts out into the aisle and is often bumped into by other passengers and crew. 57 H None No Power Seat 57 H is a standard Economy Class seat that juts out into the aisle and is often bumped into by other passengers and crew. 57 L None No Power Seat 57 L is a standard Economy Class seat. 58 C None No Power Seat 58 C is a standard Economy Class seat, however, the proximity to the lavatories may be bothersome. 58 D None No Power Seat 58 D is a standard Economy Class seat. The awkward position alignment behind the row in front might be bothersome. 58 H None No Power Seat 58 H is a standard Economy Class seat. The awkward position alignment behind the row in front might be bothersome. 58 J None No Power Seat 58 J is a standard Economy Class seat, however, the proximity to the lavatories may be bothersome. 58 L None No Power Seat 58 L is a standard Economy Class seat. 59 A None No Power Seat 59 A is a standard Economy Class seat in the last row of the aircraft that may have limited to no recline. The proximity to the lavatories and galleys may be bothersome. 59 C None No Power Seat 59 C is a standard Economy Class seat in the last row of the aircraft that may have limited to no recline. The proximity to the lavatories and galleys may be bothersome. 59 D None No Power Seat 59 D is a standard Economy Class seat that has additional legroom, however, the proximity to the lavatories and galley may be bothersome. 59 H None No Power Seat 59 H is a standard Economy Class seat, however, the proximity to the lavatories and galley may be bothersome. 59 J None No Power Seat 59 J is a standard Economy Class seat in the last row of the aircraft that may have limited to no recline. The proximity to the lavatories and galleys may be bothersome. 59 L None No Power Seat 59 L is a standard Economy Class seat in the last row of the aircraft that may have limited to no recline. The proximity to the lavatories and galleys may be bothersome. 6 A None No Power Seat 6 A is a standard Business Plus Class seat. 6 D None No Power Seat 6 D is a standard Business Plus Class seat. 6 H None No Power Seat 6 H is a standard Business Plus Class seat. 6 L None No Power Seat 6 L is a standard Business Plus Class seat. 60 D None No Power Seat 60 D is a standard Economy Class seat in the last row of the aircraft that may have limited to no recline. The proximity to the lavatories and galleys may be bothersome. 60 E None No Power Seat 60 E is a standard Economy Class seat in the last row of the aircraft that may have limited to no recline. The proximity to the lavatories and galleys may be bothersome. 60 H None No Power Seat 60 H is a standard Economy Class seat in the last row of the aircraft that may have limited to no recline. The proximity to the lavatories and galleys may be bothersome. 7 C None No Power Seat 7 C is a standard Business Plus Class seat. 7 E None No Power Seat 7 E is a standard Business Plus Class seat. 7 G None No Power Seat 7 G is a standard Business Plus Class seat. 7 J None No Power Seat 7 J is a standard Business Plus Class seat. 8 A None No Power Seat 8 A is a standard Business Plus Class seat. 8 D None No Power Seat 8 D is a standard Business Plus Class seat. 8 H None No Power Seat 8 H is a standard Business Plus Class seat. 8 L None No Power Seat 8 L is a standard Business Plus Class seat. 9 C None No Power Seat 9 C is a standard Business Plus Class seat. 9 E None No Power Seat 9 E is a standard Business Plus Class seat. 9 G None No Power Seat 9 G is a standard Business Plus Class seat. 9 J None No Power Seat 9 J is a standard Business Plus Class seat. The audio selections for both Business and Economy Class offer 200 music channels. All classes offer individual TV screens with more than 50 films in different languages and close to 80 choices for TV series and documentaries. All seats have a 110v AC power port. All seats on this aircraft also have access to a USB port at their seat. This aircraft has Wi-Fi and GSM texting capability. 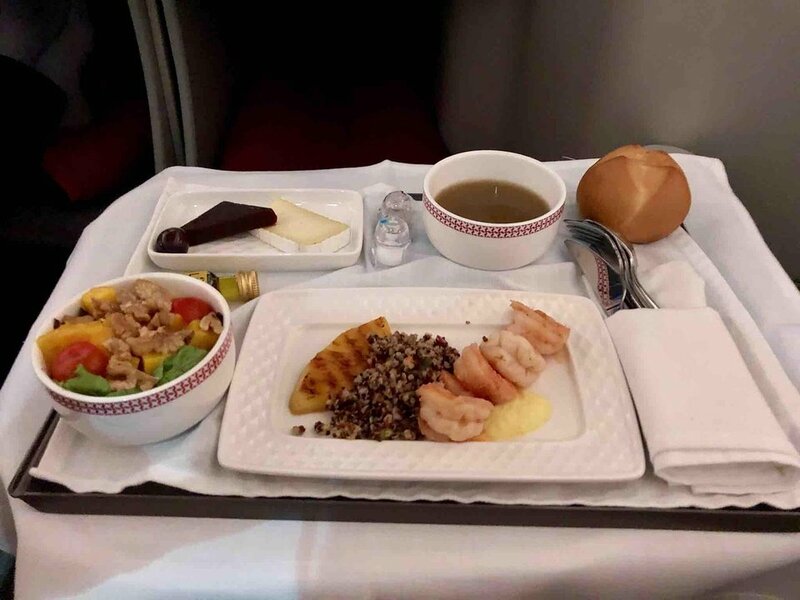 On long-haul flights, complimentary meals are served. The Iberia Airbus A340-600 aircraft operates on long-haul routes with 36 Business Plus Class seats, 23 Premium Economy Class seats and 296 seats in Economy Class, which Iberia refers to as Tourist Class. Business Plus features seats which transform to fully-flat beds and each has direct access to the aisle. While the A340 is a dog, the seat is fairly descent. Good legroom on the window seats, IFE was serviceable but the meals in F lacked. Great legroom! There is no seat in front of 59D making for plenty of legroom. Also, Iberia's fee for the seat reservation was only 30€ as opposed to 65€ for emergency exit seats. Proximity to the lavatories may be bothersome, but I'd say it's totally worth it. Be Aware....The seat is beside the curtain into buisness class which the Crew are constantly throwing open as the galley is behind. The stupid design means that the curtain is always brushing against your legs - maybe trivial, but on a 13 hour flight when you are trying to sleep it is very annoying - mentioned it to the crew, but they did nothing to help. Also this whole area is lit from the galley lighting behind, again not helpful for trying to sleep. 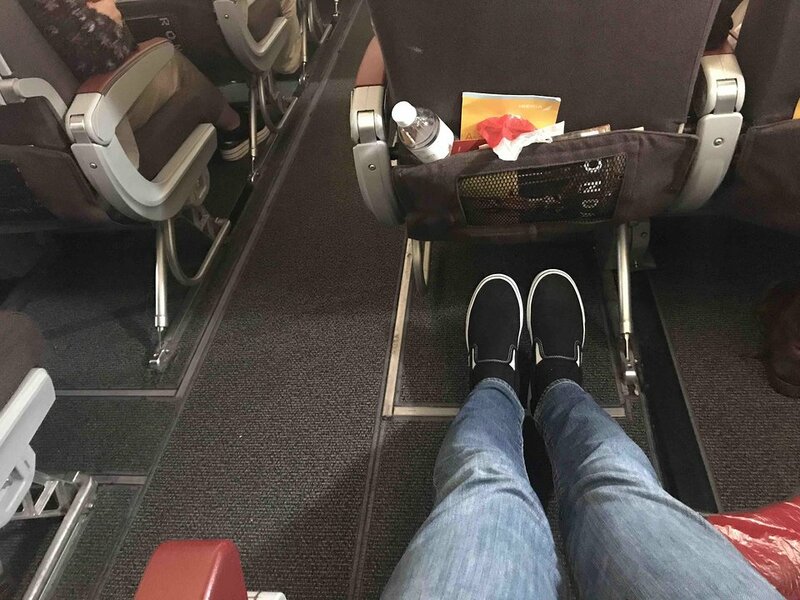 It was my first time flying in PE and coming from always using Economy and being very tall (196) I did find the flight a more confortable one. That said, its still not what I expected, seats are hard . 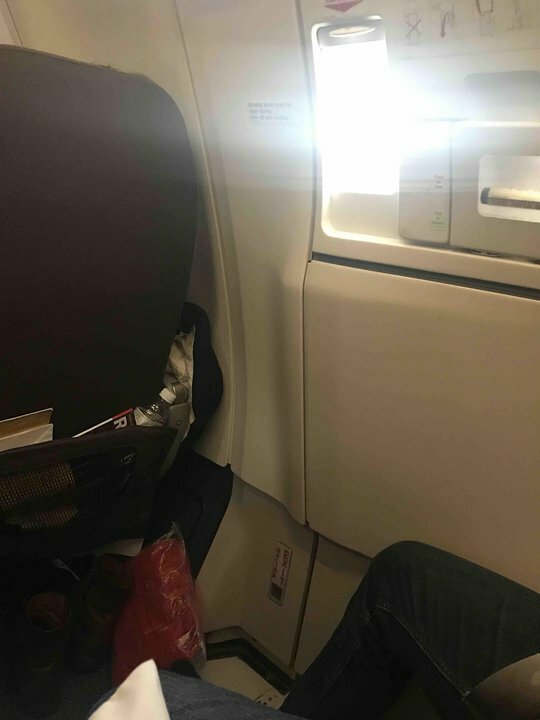 The row 11 seats have more legroom because of the bulkhead , but you cant actually extend your feet under the seat in front of you so I beleive that they are actually worse. 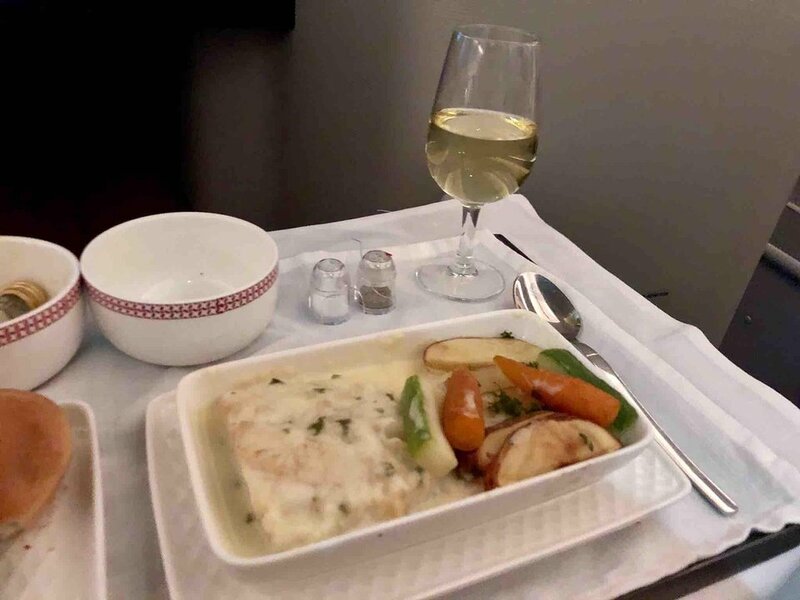 I would avoid isle seats as all the dinner service for Business Class comes from the galley behind you and the FA are constantly goin g back an forth to serve dinner. Pros: You get a drink when you board the plane, you have your own bathroom, and you leave the airplane with Business passengers. The seat is ok, however I will recommend to choose the A seat not the C. in the case of the A seat you have more privacy and don't have to be careful with your feed, the direct access to the aisle can be problematic for service or people walking in the aisle. The climate control in Iberia is always an issue, the plane was really hot at times. And for this particular flight one the bathrooms was disable due to a broken door. The soft part of the business service was goo, but the hardware is showing the age. For a Business Class seat it looks spacious but is surprisinggly small with little storage space. Trying to sleep in a over heated cabin was impossible. Legs are slotted in a hole at end of seat. I felt I was in a coffin! Food and service were awful. Why can´t IB flight attendents smile and be pleasant ? 14C was a solid premium economy seat and I wouldn't agree that the galley is bothersome from this seat as it sits decently in front of the opening. (I'd agree with the comment for 15AC, however). Overall, Seats 14AC on this plane were fine selections and away from the lavs. 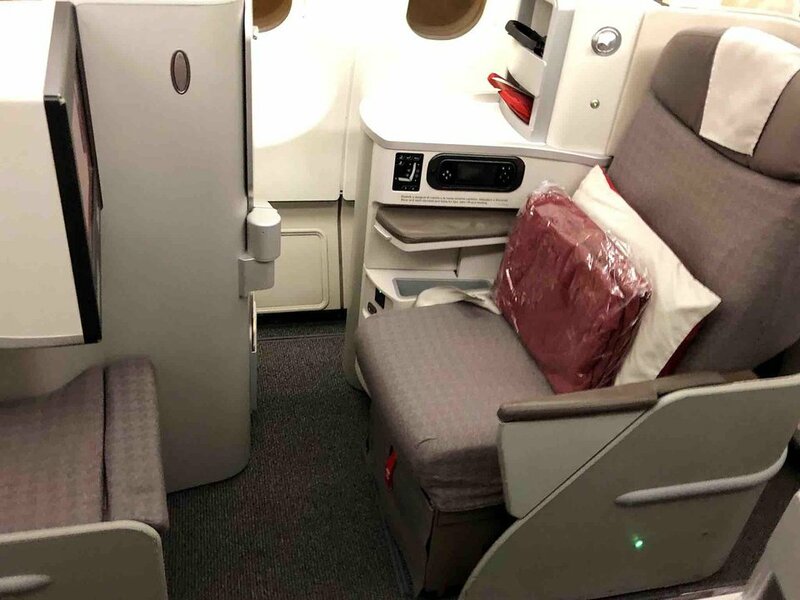 Premium economy definitely offers a much more comfortable seat than standard economy with 37" pitch (not 31" pitch that Seatguru says), increased recline, wider seats, an amenity kit/blanket, and larger screens for IFE in an intimate cabin. But the service and food is about the same as economy even though it technically is a different menu. So, if seat comfort is what you're going for, then it delivers and I actually preferred PE on the A340 over the A330 a bit because of the dedicated lav and not having to go all the way back to economy (although that wasn't that big of a deal). First row of PE seating is NOT a good seat. We had 11A and C. The business class is ahead of us and separated by a curtain that is constantly thrown onto you as the crew goes from the galley behind PE to serve Business. Totally annoying. Service on Iberia in PE is no where what other PE service is. It is worse that Economy. Buy PE for the seat but avoid the PE bulkhead seats the more leg room is not worth the annoyance . Iberia flies 2 versions of Airbus A340-600.